The TGA-4000 Series is ideal for determination of food, feed, snacks, dough, wheat and flour moisture and ash. 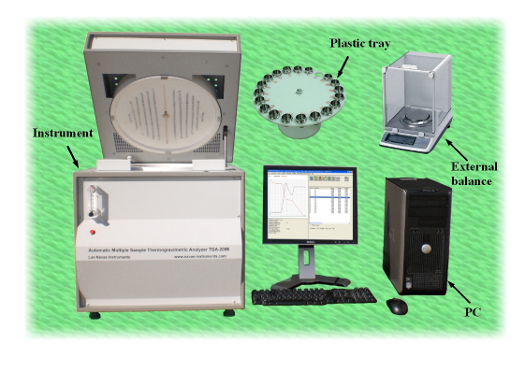 This model is similar to TGA-2000 or TGA-1000 series but with an additional external balance used to obtain the initial weights of crucibles and samples outside furnace during the analysis time for increased throughput. The TGA-4000 series uses only one PC or laptop to manage both the external balance and the instrument at the same time. This configuration allows from 20 to 60% more throughput. Different sizes of ceramic crucibles can be used depending on the size of the sample to be analyzed. During the analysis of the first batch of samples, the initial weights of crucibles, samples and/or covers are obtained in external balance and placed in plastic trays or removable carousels ready for next analysis, thus eliminating dead loading time. When furnace reaches 60-70 ºC (after cooling, instead of 34 ºC ) the pre-weighed crucibles with samples are moved by hand from plastic tray to carousel. Operator presses the start button using the mouse in the TGA software and the instrument starts immediately analyzing (does not take need to take the initial weights of crucibles & samples, saving 20 or more minutes of loading time). Any number of trays with pre-weighed crucibles and samples can be prepared during furnace analysis time. The productivity center software can work also with multiple TGA units in a networking configuration. 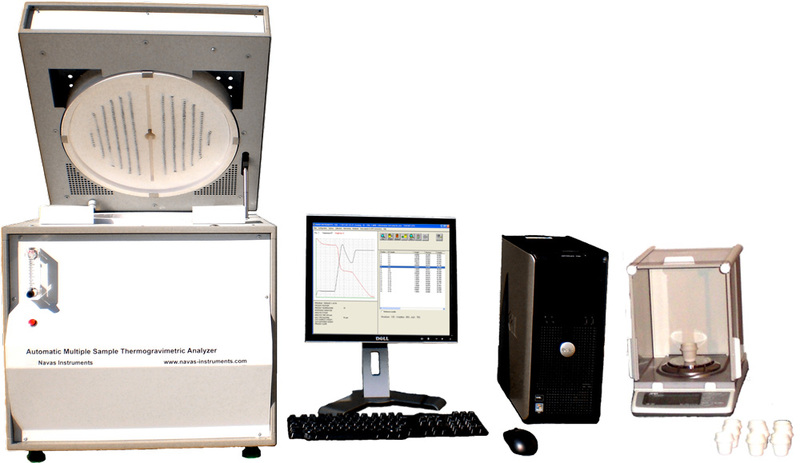 Model TGA-4000 uses only one (1) PC to manage both the instrument and the external balance at the same time. There are also dual TGA-4000 models with one (1) PC that controls the two (2) instruments and one (1) external balance at the same time. Any number of TGA units can be connected in a network for customers with large numbers of samples to analyze.